Cole Horton - Author & Professional Geek: JANGOs: Bounty Hunter or Junior Army Navy Girls? JANGOs: Bounty Hunter or Junior Army Navy Girls? What's the first thing that comes to mind when I say "Jango?" If you frequent this blog, you probably think of a tough bounty hunter from Star Wars Episode II. Think about it, Jango is the guy whose DNA was used to the clone army and he's the "father" of the galaxy's most famous bounty hunter, Boba Fett! He's a blaster-wielding, scar-faced, manly-man. 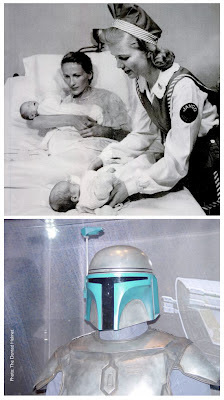 I hate to ruin it for you, but if you lived during World War II, a JANGO was something very, very different. The Second World War was an all out effort from virtually everyone and even the daughters of Army and Navy officers pitched in. The Junior Army Navy Girls Organization and its members called JANGOs served as nurses on the home front. Their duties as a JANGO included caring for newborn babies on base. So next time you see an amazing Jango Fett costumer or watch Attack of the Clones, don't forget the original JANGOs serving in World War II.